Our camping pads use exclusive patented technology with world-leading designs! the Klymit sleeping pad is your lightweight, ultra-comfortable alternative to the standard air mattress. Don’t waste your time, energy or money on a blow up air mattress that’ll deflate during the night. Our innovative sleeping pad inflates quickly with a handful of breaths and will stay inflated until you pull the plug. Using cutting edge insulation and body technology, your sleeping pad will keep your warm and comfortable all night long. How? By limiting air movement and heat loss whilst comforting to the contours of your body. This helps us provide you with the most comfortable outdoor sleeping solution on the market. Sleep soundly with Klymit, to make the most of every outdoor adventure. Introducing the Static Pad: your economical, four-season sleeping solution. Available in a range of sizes, this minimalist, full-featured design will take you from summer to winter without compromising on your comfort. 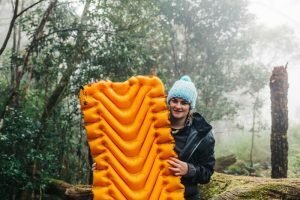 Whether you’re hiking, camping or pack rafting, the Static camping pad is unparalleled for full body support, insulation and weight distribution for greater comfort all through the night. From our best-selling Insulated Static V Lite to the military-friendly Static V Recon to our oversized, extra-plush Static V Luxe, these camping pads represent a landmark in outdoor comfort. Whether you’re sleeping on the ground, in a tent, a cot or a hammock, the Static Pads allow you to enjoy all the benefits of our ground-breaking design and technology without the higher price tag. The Inertia Pads are our premium series of camping pads, designed for the serious outdoor enthusiast. With all the features of the Static Pad range plus added weight savings, dynamic movement and thermal efficiency, Inertia Pads are the lightest full-length sleeping pads available on the market today! Our full collection of Inertia Pads ranges from the ultralight Inertia X Lite and Inertia X Frame to the extra-long and extra-wide Inertia XL, to models with an integrated head pillow like the Inertia O Zone, and more. Use it with or without a sleeping bag for a compact sleeping solution, ideal for any adventure where every gram counts. At Klymit, we’ve spent many years developing, refining and perfecting the revolutionary technology behind our world-leading sleeping and camping pads. 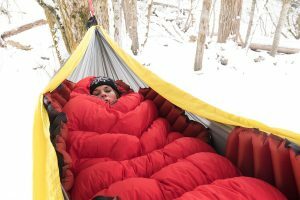 Determined to change the way you experience the outdoors, we combined cutting-edge technology with our new way of thinking to create our line of ultra-lightweight, ultra-comfortable and ultra-durable sleeping mats that mean you’ll never be weighed down by large, bulky camping gear ever again. Plus, thanks to the superior comfort technology and design behind our camping pads, you’ll always get a good night’s sleep, no matter the climate or conditions. Our exclusive, patent pending loft pocket technology is what makes each camping pad so warm and soft. Instead of insulating only the underside like a regular sleeping bag, Klymit sleeping pads are designed with innovative loft pockets and deep welds so that when placed either under or inside your sleeping bag, will capture warmth throughout the whole sleeping bag. That means a soft and puffy sleeping pad all night long, and lasting insulation to take you through every season. We’ve also utilised unique body mapping technology that makes your camping pad mirror and conform to the contours of your body using a pressure point body map and anatomical body map. This means that no matter what position you sleep in, your sleeping mat will naturally accommodate your body and disperse pressure evenly to ensure better comfort and a better night’s sleep. Through every season and across every type of terrain, Klymit lets you experience nature without compromising on your comfort. At Klymit, we are committed to making the outdoors more comfortable than ever with our exclusive range of sleeping camping pads. 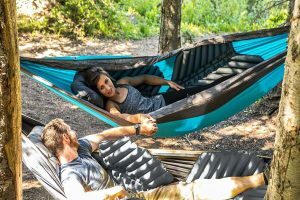 From camping to hiking, mountain biking to pack rafting, the Static and Inertia Pads will let you recline and rest easy at the end of a long day – but without the excess weight of a traditional air mattress. Discover the difference for yourself today and take luxury to the outdoors with Klymit.